The mainstream media are no longer even attempting to hide their bias against conservatives. Hollywood and entertainment play an essential role in the left’s all-out assault on anyone who disagrees with them. Late-nite comic Jimmy Kimmel’s interview with one former Trump staffer is the latest example of just how vulgar and biased the left has become. Late-nite comedians have become the infantry unit of the left’s army against Republicans. This gambit has allowed them to do the Democrats’ dirty work. These comedy show impresarios used to be nonpartisan and unifying forces for the country. But lately, they’ve literally devolved into left-wing shills. Jimmy Kimmel was briefed by Senate Minority Leader Chuck Schumer on healthcare before he unleashed a tear-filled rant on the topic. Comedy Central’s Trevor Noah likened Donald Trump to an African warlord. Noah was silent during Obama’s two terms when he was jailing reporters, prosecuting whistleblowers, and sanctioning drone strikes on U.S. citizens. Noah explained the left’s lack of comedic jabs on the Obama administration on Obama jokes being too difficult to craft. Samantha Bee — also on Comedy Central — called Ivanka Trump a “feckless c*nt” for having the audacity to be Donald Trump’s daughter. Stephen Colbert made homophobic jokes about Trump and Vladimir Putin, which apparently is acceptable if the target of the derision is a Republican. In perhaps the saddest case, Jimmy Fallon was bullied into criticizing the president because the left felt he had been too apolitical on his show. This is the current late-nite comedy landscape that exists. They’re not even telling jokes at this point. It’s just an unending combination of warmed-over Democratic talking points and caustic remarks aimed at Republicans. The latest example of this came on Jimmy Kimmel’s show. JK: What did your mom think of all the abuse you got? There were a lot of jokes made at your expense. SS: My mom, my dad and my wife have been my strongest advocates and supporters. I think there were clearly times where she felt…for me in a way that only a mother can. It’s amusing that Kimmel tried to empathize with the abuse Spicer got when he and his cohorts were the main culprits of the endless attacks. Kimmel and other members of the mainstream media are always looking for Trump associates to turn on the president. It’s impossible for them to hide their giddiness. 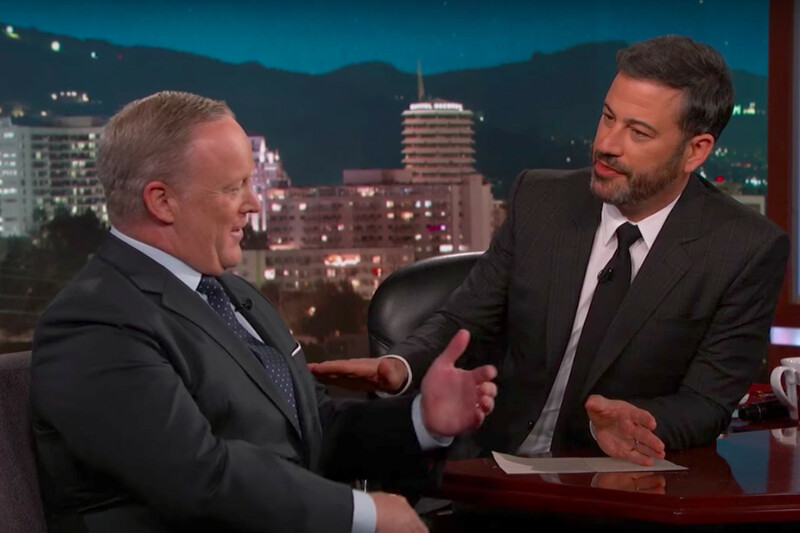 Kimmel coaxed Spicer more than once, but he didn’t take the cheese. The left has hollowed out comedy entirely. The oversensitivity to anything even remotely politically incorrect gets met with an immediate deluge of backlash from the left. As a result, many comics won’t even perform at college campuses. The only permissible form of edgy comedy these days must target conservatives. Jimmy Kimmel, who once did a sketch wearing blackface, is now appropriately woke and gets free rein from the left.